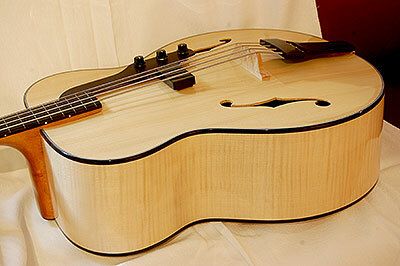 The Archtop Acoustic Bass is inspired by the Mexican Guitaron. The idea of a Guitaron is to produce a maximum of bass by a big, voluminous body and a pretty short six string neck. Who ever could hear one will confirm that this idea works. The Acoustic Bass is built in a similar way. The body has a depth of 16cm/6.3“ to create bass frequencies as low as possible. The length of the body equals an 18“, the width the one of a 17“. As the Guitaron proofs, it is not the string length which is essentially responsible for the low frequencies (a Guitaron has a 65cm/25.6“ scale length), but the volume of the body. The Acoustic Bass has a conventional four string neck with a 78cm/30.7“ scale lenght. Due to this construction the Acoustic Bass produces a powerful and bassy sound, which gives the sound of the ensemble a strong basis when being played in small acoustic settings. For situations in bigger venues the Bass is amplified with a floating Lemme humbucker. Even if this is a magnetic pickup it still reproduces the acoustic character of the bass very authentically. The idea of the Acoustic Bass is on the one hand to provide a handy but projecting instrument to the bassist. It would give him the chance to replace the bulky double bass with an effectiv instrument and easy to handle e. g. on gigs in cramped rooms. On the other hand the Bass should appeal to guitar players who are in need of playing bass but do not have time to learn double bass. The Acoustic Bass offers easy playability to them since they can play it in the familiar guitar position. The fret markers on the fretless neck make intonation easy.